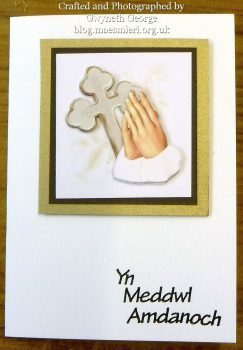 Previously I’ve shown you the first six from a collection of 12 Welsh Sympathy Cards I was asked to make. Today I’ve got the second six to show you. 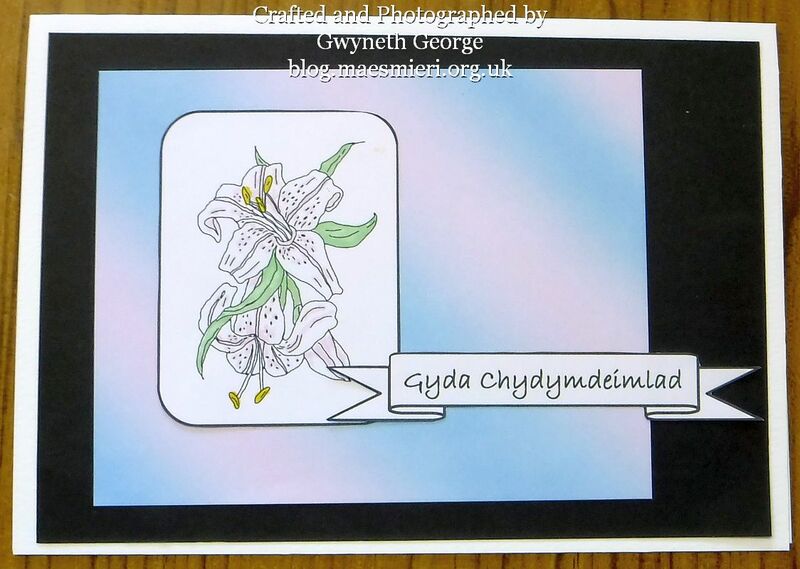 For this card I used a digi stamp – Beautiful Lilies Digi Stamp by Stephen Poore – that I printed out onto 120gsm Super Smooth heavyweight paper. 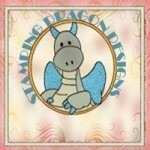 This I coloured in using alcohol markers (Promarkers – Blossom, Flexmarker – Apple, and Nuvo Marker – 405). 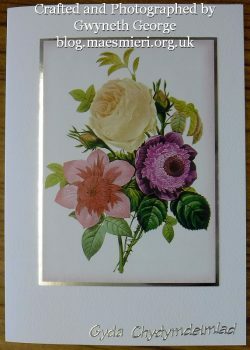 This was cut out, matted and layered, and stuck onto an A5 white base card in landscape orientation. 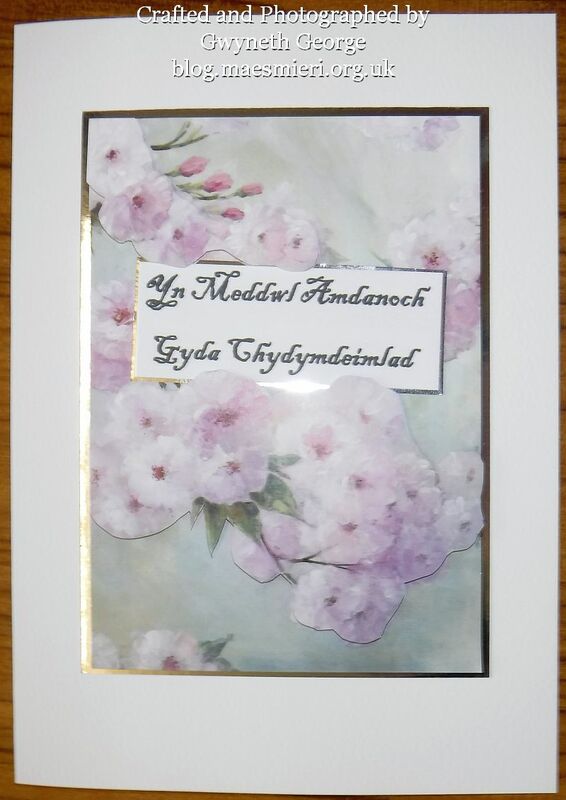 A greeting, printed out onto the same paper, was also added. 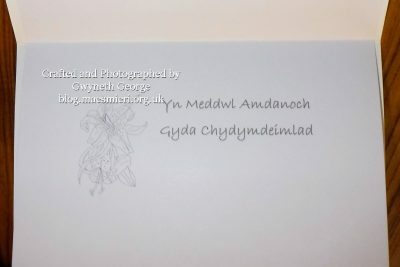 I also printed the same digistamp, together with a greeting, out onto the same type of white paper, to use as an insert. For this I printed it out in a shade of grey instead of black, and didn’t colour on in. 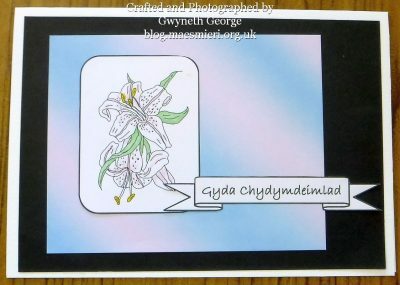 For this simple A5 card I took a floral image from one of the Hunkydory “Little Book Of …” and matted it onto one of the Hunkydory mirri mats. 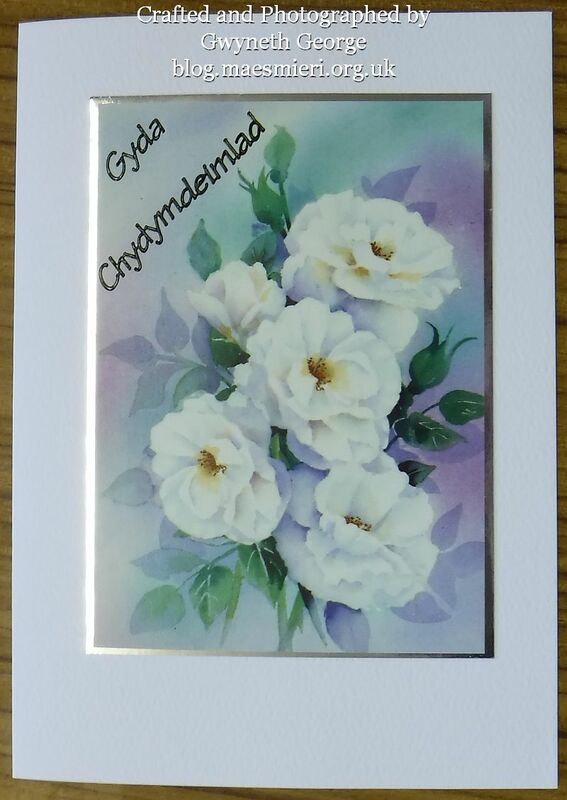 This matted image was then stuck to the front of the card, whuch was finished off with a peeloff greeting and an insert with the same greeting. 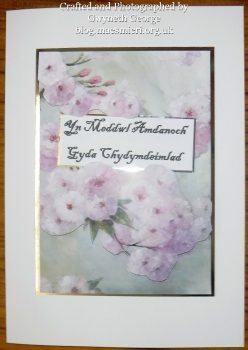 Another card made the same way as the previous one . For this one I also used an image from one of the Hunkydory floral “Little Book Of …”, but I took two copies of the image and cut one up to give me flower pieces to decupage. 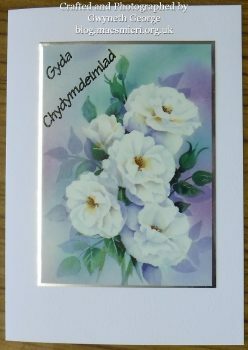 I printed out a greeting for this card which I cut out and matted onto a piece of the same mirror card as the mat for the main image. 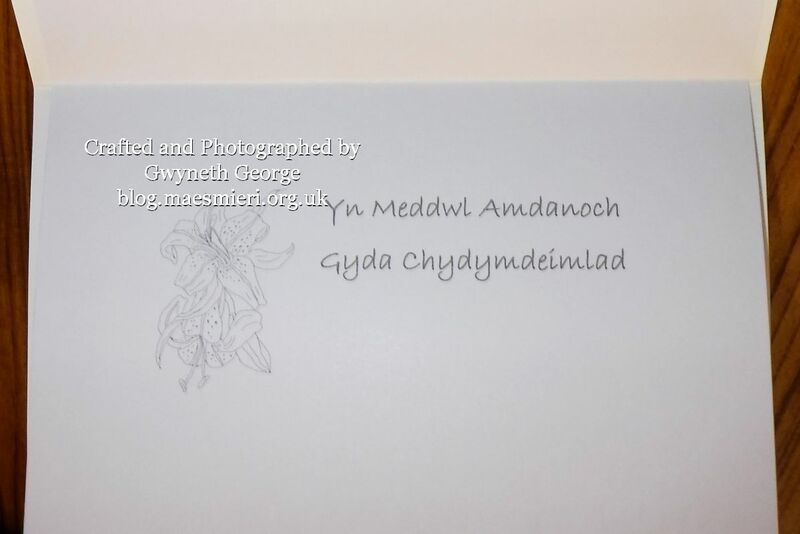 Fingerlift tape was used for this matting and also for layering the greeting onto the front of the image. I then used 2mm deep foam tape to attach the additional flower layer. 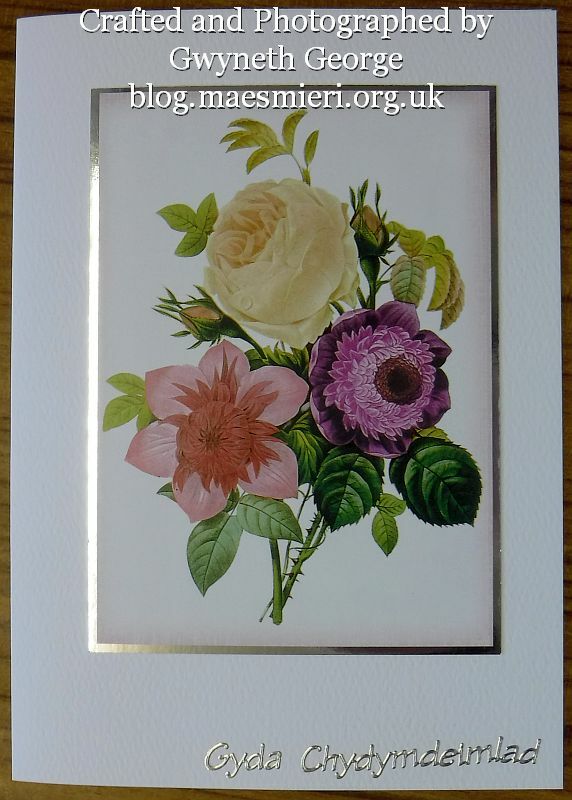 This is the same card with the photo taken at an angle to try and show the dimension of the decoupaged flowers that overlap the greetings panel. 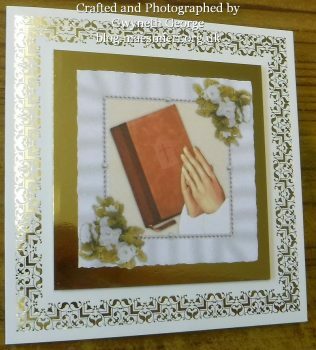 The base card I used for this card is a pre foiled 6″ card from Kanban. 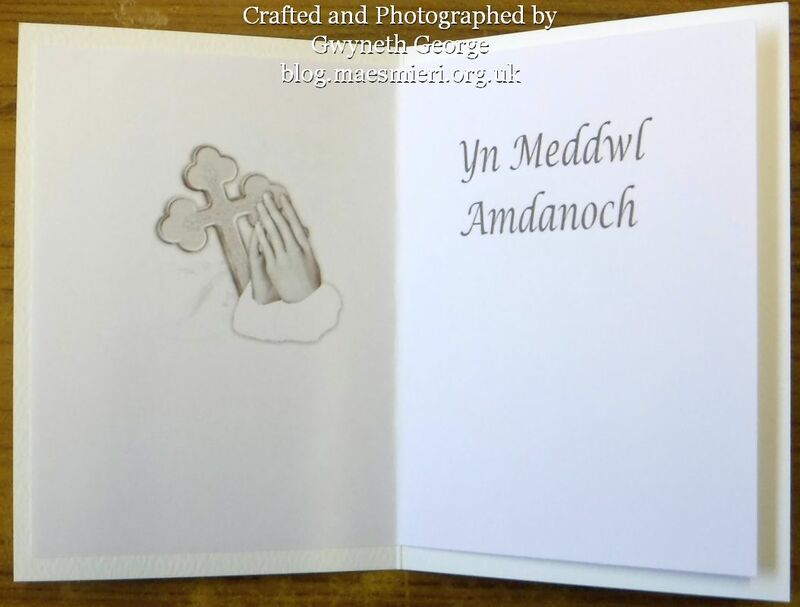 The image is one from a collection of images called “12 Religious designs” by Vicki Avcin. I resized it before printing it out onto 120gsm Super Smooth heavyweight paper. 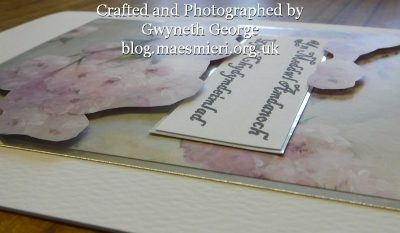 After cutting it out I matted it onto some mirror card and then stuck the matted image onto the card using 2mm deep foam tape. You can see that the matted image is slightly raised by the the foam tape in this side photo. 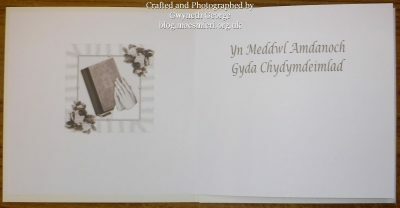 I also used the My Craft Studio Elite software to quickly build up a matching insert by turning the image into greyscale and adding a greeting. 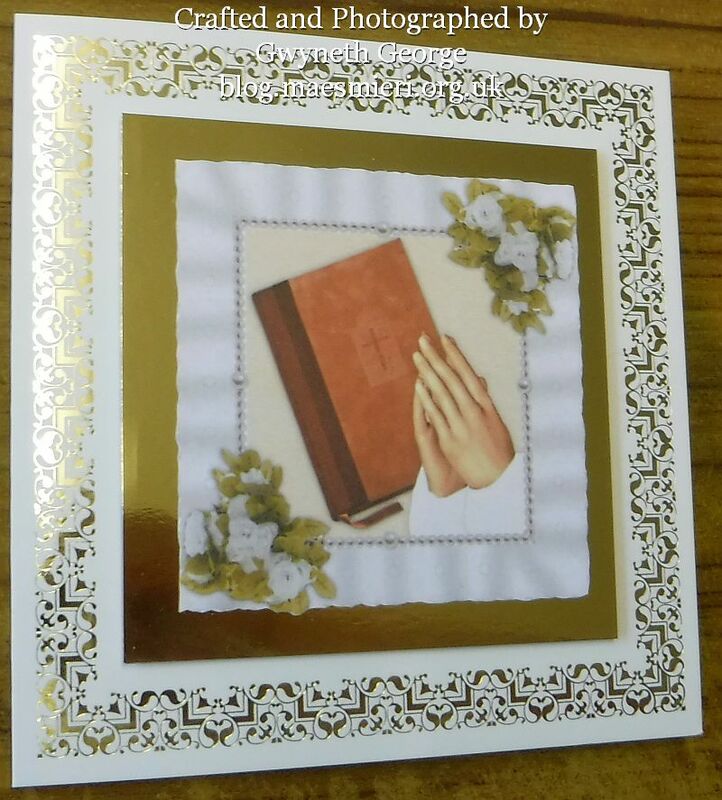 The same paper was used for printing and it was inserted into the card using more fingerlift tape. 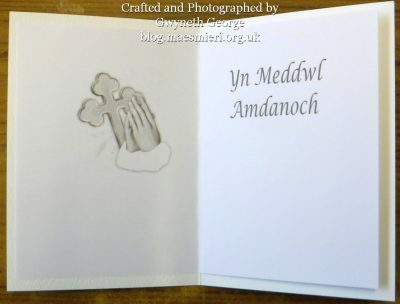 This is another image from the same “12 Religious designs” by Vicki Avcin. 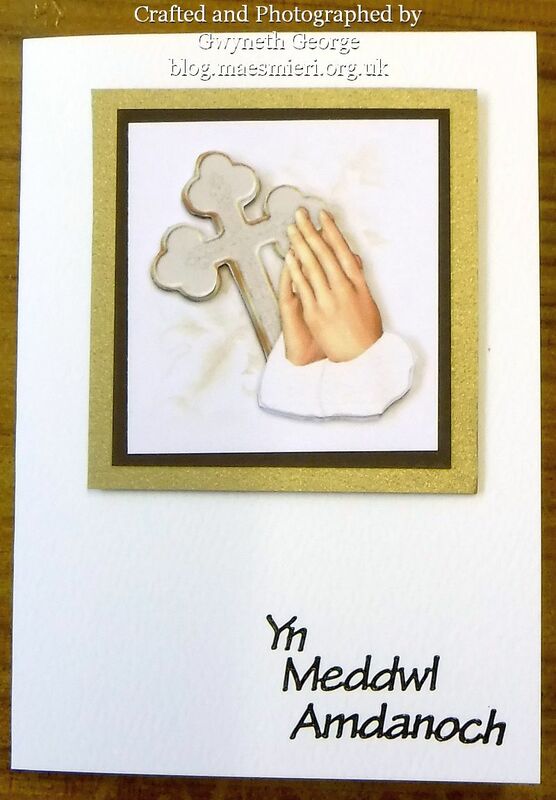 This time I printed it out twice and cut the praying hands and cross out from one image. 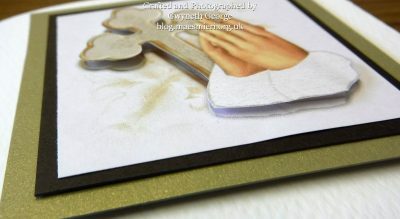 The main image was matted onto some of Lynda’s brown cardstock and then onto frosted gold cardstock. 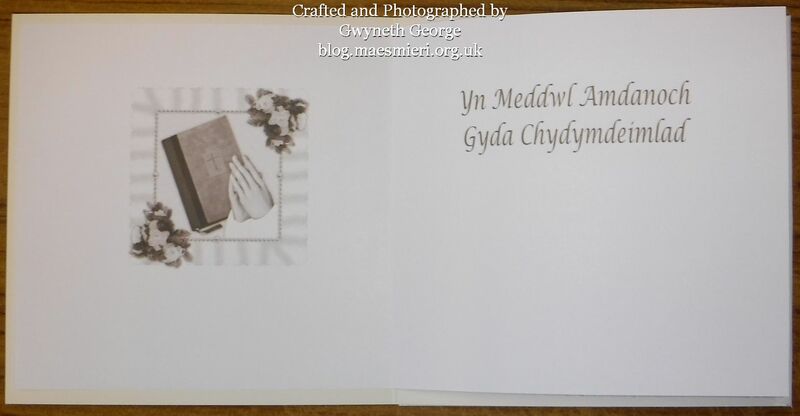 I then used 2mm deep foam tape to add the cut out layer to the front image of the card, and then to add the matted image to the front of an A6 white base card. Here’s a side view to show the dimension created with the foam tape. 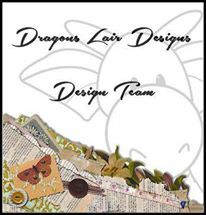 In the same way as I made an insert for the previous card I made one for this card as well. In case you haven’t seen it already – I’ve managed to buy two of the same thing so I’m giving one away. Read about it at the bottom of my blog post – here. 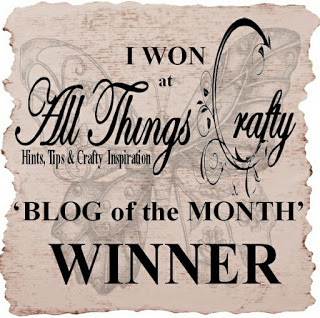 Just leave a comment on that post that you would like to be entered into the draw for the giveaway.